The incident came barely four days after some herdsmen launched deadly attack in Attakwu community, Nkanu West Local Government Area of Enugu State. 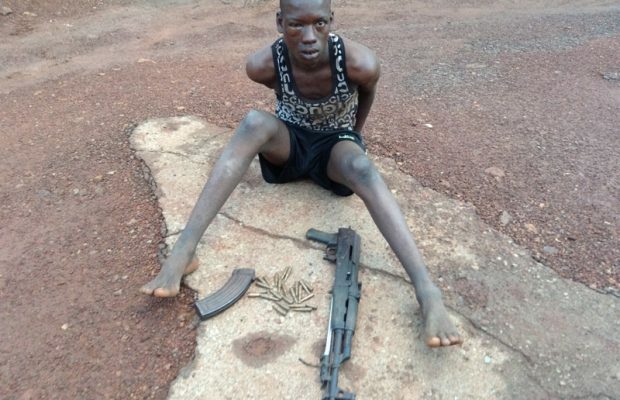 It was gathered that the 20-year-old suspect, who identified himself as Ibrahim Adamumale, was nabbed in Affa, Udi Local Government Area of Enugu State. A source hinted that he was in possession of the sophisticated gun, with 24 rounds of live ammunitions. He added that “the suspect was nabbed on 29/8/16 by the combined efforts of the police and the members of the public from Affa, acting on a tip off. “The suspect, before he was nabbed, had expended about six shots on the air to evade arrest, but he failed to the superior effort of the police and members of the public, who have gathered information about his antecedents in relation to bearing sophisticated weapon, within Affa axis and its environs. “The suspect is now helping the police in their investigations in relation to how he came about the riffle. “The state commissioner of police, Emmanuel Ojukwu has expressed delight at the effort of his men and the community leading to the arrest of the suspected hoodlum and the recovery of the gun and ammunition.